The RIAA has changed its tactic. No longer will they sue random people for file sharing. Now they're going after the ISPs. While many of the large media company ISPs such as AOL, Comcast, etc., will almost certainly comply, what will the smaller, independent ISPs do? How will large telcos like Verizon react? The Free Software Foundation's DefectiveByDesign campaign has set-up a fund to pay for expert witnesses in key RIAA lawsuits brought against US citizens. In a detailed article, ArsTechnica looks at whether or not the RIAA could be tried under the RICO statutes that have typically been used to prosecute organized crime. Only tangentially related to DRM in that the perpetrator of the crime against the public is the same, internet radio is under attack! The RIAA and record companies have been pushing for an increase in royalties for internet radio play. The increase is absurdly high compared to the royalties other formats (terrestrial and satellite) pay. The Copyright Royalty Board rejected a request for appeal filed by NPR and other webcasters. A DBD member in Seattle sent me story about record labels abandoning the RIAA from her blog earlier this morning. Gizmodo is calling for a boycott of the RIAA in March by avoiding purchasing music from record labels/artists that are members of the RIAA. How do you know what labels are part of the RIAA? Gizmodo points to RIAA Radar for a directory. Bruce Byfield writes A coalition of public interest groups and academic privacy experts has released a public letter and background paper to the Canadian government stating their concerns about digital rights management (DRM) technologies and their legal status." 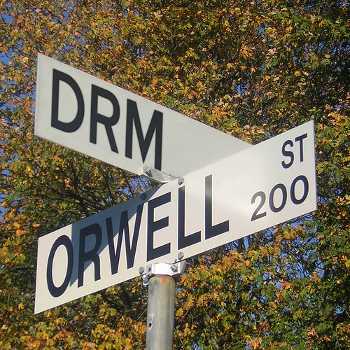 They write,"DRM is used by some copyright holders ostensibly to control access to and use of copyright works. In fact, DRM technology can be used to override fundamental privacy protections. DRM typically uses surveillance to monitor and collect detailed information about people’s access to and use of creative works. CEO of BPI "sounded tired"
"He said that I was the 17th call he had received :) he sounded tired. I asked what he thought about DRM. He said, "I only found out what it meant a few days ago". I told him that I didn't want DRM in my music or technology. He said "DRM was allowing music to be made available online". I said I don't want locks on my culture. He said "DRM allows you buy your culture", and said I should "go and educate myself." Read more about CEO of BPI "sounded tired"
"Spoke to secretary. The poor lady complained that she hadn't even had coffe yet and that it was too early for all of this. I asked her about DRM and gave my case concerning it to her. She said its been hellacious so far with the calls but that everyone have been nice and respectful. The suits are throwing their secretaries under the bus today." Read more about "It's been hellacious"
Canadian Exec Gets The Message! One successful caller stayed on message with Graham Henderson, CEO of the Canadian Recording Industry Association. "I basically explained that I am a music lover who owns about 300 CDs and that I would like to be able to buy music online. However I was not willing to do that unless it enabled me to do the same lawful uses that CDs do. I asked him to reconsider his position on DRM and to ask Apple to sell DRM free music." Read more about Canadian Exec Gets The Message!